Dedicated, resilient, courageous, consistent, and patient are just some of the qualities that made Grace one of the greatest performers in the history of Hanover Cross Country. She earned a full athletic scholarship to Boston College after high school, and has recently come full circle as an volunteer coach with Hanover Cross Country, while pursuing a nursing degree. In addition to running cross country for four years, Grace was an outstanding 800 meter runner with a PR of 2:12. Her meteoric rise from JV Champ her 9th grade year, to helping the 2007 girls’ team place 4th in the nation at the Nike Cross Nationals, was a remarkable athletic accomplishment. Grace was Hanover’s 5th runner that challenging December day in Portland, Oregon. Because of that performance, the Grace Rodriguez 5th Runner Award was christened and is now annually awarded to the 5th runner at the Hanover XC banquet. 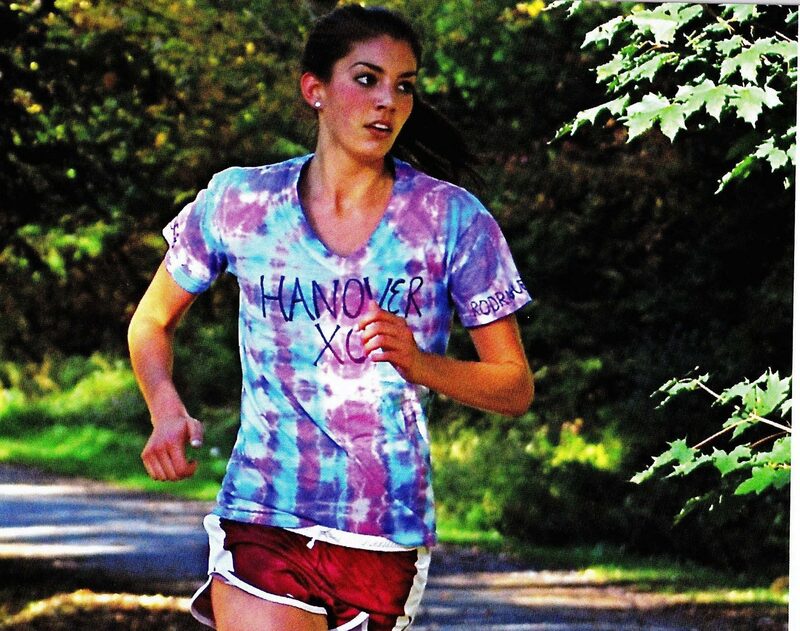 Running varsity all four years, Grace played a vital role in Hanover’s unprecedented success. As well as garnering many accolades at the Hanover XC banquet, she earned All-Class I (D2) for three years and All State her senior year at the annual NH Cross Country Banquet. Her PR at Derryfield Park was 19:06 and Mines Falls 18:27. In closing, Grace was a great teammate to all and more important, a great person and role model for all. You joined the cross country team in the fall of 2005, what do you remember from that first season? Why did you decide to run cross country? I had always planned to run track in high school since I was young, but it was really my middle school track coach, Chris Brown, who encouraged me to go out for the team. I was a bit hesitant as I had no experience with distance running. Playing other sports growing up I was always pretty fast, so I knew running was something I might want to pursue when I got older but I didn’t know much more than that. I remember my first training run going into my freshman year – one mile around the Dartmouth track! My parents also used to show me newspaper clippings from the cross country team when I was in elementary and middle school, so I always knew it was a great program and had heard it was a fun and successful team. Mr. Eakin of course had a great reputation around town as well. I remember being excited to come in as a freshman and I really wanted to do well and work hard, but the sport really tests you! At first I was shocked at how brutal races and workouts could be, and was so impressed and inspired by how all of the upperclassmen were acting like this was all perfectly normal. Describe the Hanover XC running culture at that time. What motivated you to become such an accomplished runner? I feel so lucky to have been a part of the Hanover XC team during a time when the running culture was so well established! Probably starting with runners like Russell Brown and Catherine Bryson, there was a real legacy of excellence established at HHS. By the time I joined the team so many talented runners and generally hardworking people comprised the team, that it was hard not be inspired. I had so many girls to look up to my freshman year, there was never any shortage of motivation. I felt that if you wanted to make varsity XC at Hanover, you just had to take it seriously and really go for it, and that’s what I tried to do. I knew I wasn’t a natural born cross country runner, middle distance was my strength, but XC became so important to me because it provided a strong base for track, and more importantly allowed me to experience being part of a really special team and program. While many runners took the program, training, and racing seriously, there was also a such a fun team element. The team was huge when I was around. There were so many traditions established, and it was all very inclusive – Mr. Eakin always somehow managed to include runners of all ability levels. You really felt like you were a part of something and like you mattered. Describe your most memorable moment running cross country in high school. Of course, being on the team that qualified to run at Nike Team Nationals in 2007 was an amazing experience. But it wasn’t just that one meet, it was the whole season, and the whole body of work and teamwork that it took to make that happen. The seven of us all really wanted the chance to try to qualify for nationals after winning New England’s and performing well at other big meets, and we were thankful Mr. Eakin supported us to go for it and was able to keep us healthy for a very extended season. I remember running that race at NXN in Oregon and just having no idea how were doing, even when we finished and for a while after, we were all just freezing and muddy and huddled together wrapped in space blankets. Then we found out that we placed up 4th in the nation and it was just such a surprise, such a special moment! I think the whole 2007 season capped off with nationals taught me what it really means and feels like to be part of a super tight-knit team. The team was so deep and besides Georgia and Heidi consistently being 1-2 for us, runners 3-6 switched around a lot, so when one person had an off day, it was really cool to see how one of us was able to step up. Not only on varsity, but there were several other girls on the team at the time who could have run varsity if needed. On any given day – there was a ton of depth and support. Describe your least memorable experience running cross country in high school? What did you learn from this experience. Which experience (most memorable or least memorable) helped you the most? It does not have to be just from an athletic standpoint. I would say my first ever XC race at Thetford was one I used to try to forget! I finished, but I walked up part of the “big hill” and felt super embarrassed about that. I remember thinking during that moment “this whole cross country thing is going to be way harder than I thought. 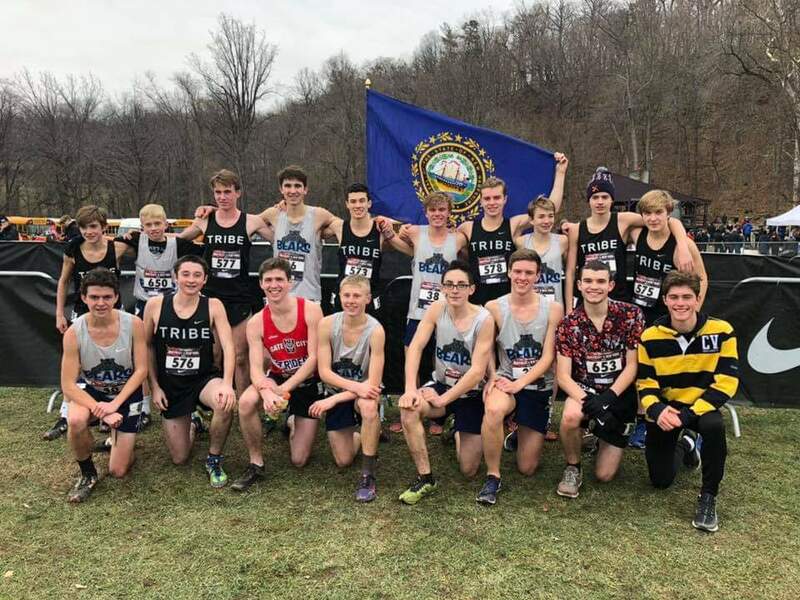 I’m going to need to toughen up.” Again, I was shocked (and inspired) that all of these high school runners and my teammates were able to put themselves through the agony of racing! I had a somewhat traumatic experience running New England’s my freshman year as well, which was also at Thetford. However, we ended up running the Thetford course for smaller early season races when I was a sophomore and junior, so I was able to acquire some really positive memories from that course too. We would run those races together as a pack and take turns leading. That really helped me to face my fears and learn to enjoy running Thetford! When and what did you usually eat before a race or a challenging workout? I would eat my main meal about 2 ½ hours before a race. If I was home, it would be scrambled eggs whites (I used to hate yolks) and a whole grain English muffin, or some kind whole grain toast with almond butter and banana situation. Then I would have a little snack closer to the race, just a nibble of a brown rice cake with almond butter and honey. Pretty simple stuff. Post race was chocolate milk and pineapple to aid with recovery. For no special reason besides that the are my all time favorite, I would also almost always have a honey crisp apple as a post-race or pre-workout. I don’t eat gluten or much dairy these days, so my toast and chocolate milk would now probably be gluten-free and almond milk instead of cow’s milk 🙂 I would also probably go for a sweet potato or avocado toast now that my tastes have “matured” a bit. But you really can’t go wrong with banana and nut butter! Did you have any health related issues that had a serious impact on your competing such as fatigue, sleep problems, eating disorders, performance anxiety, etc.? I stayed very healthy throughout high school in terms of injuries and general health until track my senior year. Anemia, hypothyroidism, and other hormonal issues became big challenges for me around this time and I struggled to manage them in college. It was pretty easy to deal with health issues in high school with the support of family, coaches, and health professionals – people who really knew me well – but running in college presented itself with a whole bunch of new but related health issues as training, demands, and stress increased. I really had to learn a lot about my body, how it responds to certain types of training, how to take care of myself, and look out for myself on my own. This was the hardest thing to navigate because as a runner you are really in touch with your body, and at a certain point running in college I knew something was really off, but since it wasn’t an external injury, it was hard to understand, explain, and justify. I felt an immense amount of pressure both internally and externally to keep pushing myself, train harder, be tougher, be successful etc. and really ended up getting run into the ground physically, mentally, and emotionally. At that point I had to take a step back from the sport, get some perspective and regroup. What were some of your favorite high school workouts and favorite places to run? Did you do any running during the summer to get in shape for fall cross country? I followed Mr. Eakin’s training plan for rookies the summer before my freshman year, and then the veteran’s training program every summer after that. They both served me well! I always took the approach of fully trusting my coaches and followed their training plans very closely. I only really veered off the plan by adding more core work and a little bit of strength training on the side. I think I really benefited from the Hanover summer training because it gave me a solid base to start the season, but was in no way too much, or over-training. I personally do much better with lower mileage than many other XC runners, so for me it was just right, reasonable, but still required dedication. I think this approach saved some of us from burning out, something that Mr. Eakin was always smart about. What else did you do to stay in shape during the season and in between seasons? Yoga? Nutrition? Weights? Resistance training? Cross training? Massage? Meditation? I ran all three seasons at Hanover and in college as well. In high school I took a full 2 weeks totally off between seasons, and 3 or 4 weeks off after spring track to recover and reset. I stayed active but really made an effort to take it easy because it’s a long year of running. I wish I had known all the benefits of yoga and meditation in high school and would have incorporated it into my training and downtime as it’s something I am very into now. I’ve always been a big fan of sports massage and would get a deep tissue sports massage the Thursday before a Saturday race if I could swing it. I always included lots of foam rolling, ice baths, and deep stretching post-run. In terms of cross training, I did a lot of pool running when any little injuries came up or I was feeling run down – big aqua jogging fan! Knowing what I know now, I probably would have followed a slightly different diet, but with the knowledge that was available to me at the time, I think I managed to do a decent job and tried to eat a plant-based, anti-inflammatory diet. Did you think racing at the challenging Derryfield Park for the divisional state championships was to your advantage or disadvantage? Do you think the pre race simulation in the gym the day before the Class meet helped? Do you think it the simulation should have been used more often? I think racing at Derryfield Park for Class I state championships was an advantage for Hanover. Running Manchester Invitational early in the season definitely helped prepare us for states as well. Being more of a track specialist and middle distance runner, as well as being quite tall, I have always preferred a flat course where you can really fly and settle into a quick pace. Running flat courses always felt more natural to me so I looked forward to races like Meet of Champs in Nashua where there wasn’t a hill to be found. That said, hills are pretty much unavoidable in Hanover, NH and Norwich, VT where we all did our training, so Derryfield was always a good test of both physical and mental strength. I think it made us all more well-rounded runners. The pre-race simulation with Mr. Eakin in the gym the day before states always got us all in the mood to compete at states. It was something I carried with me into track and life in general as it helped to calm nerves and anticipation anxiety. Setting aside a specific amount of time for simulations, visualizations, meditations, or simply just allowing yourself time to worry and go through everything that could possibly go right or wrong (just for an allotted period of time), and then truly allowing yourself to just let it go and not overthink your race until you’re at the starting line can be really helpful. You went on to run at Boston College on a full athletic scholarship, describe the differences and similarities between high school and college cross country: training, competing, relationships with teammates/coaches, balancing running with college course work, etc. I found running in college to be quite manageable in terms of balancing school work with training, and travel to races as long as I stayed on top of things. Hanover High prepares you well for a college workload. BC was great in that they have a really strong athletic program and treat their athletes very well, so they have a lot of support available for student-athletes in terms of academic resources that I took advantage of and found to be helpful. The team environment was very different than in high school and certainly required you to look out for yourself more. A lot of the girls on the team at BC were runners whose careers’ I had followed in high school, and found it very inspiring and humbling to train with teammates who I had looked up to for years. The training was definitely demanding and I found myself running high school PR’s in workouts right off the bat my freshman year! What type of work are you involved in? Do you still run? Yes, I still run! I took a big break and necessary break from running after college, but I’ve gotten back into it, particularly in the last year. In terms of work, I am in the wellness field and teach vinyasa and restorative yoga. I’m a board certified health coach, and a natural foods chef – I did all my training while I was living in NYC after college. This fall I am back in town and have been helping to coach the Hanover XC team which has been such a pleasure and a throwback! I am actually going back to nursing school this winter for a degree that will allow me to work with a functional medicine doctor as a nurse. Functional medicine is like integrative medicine, meaning it takes a systems approach (looking at all the systems of the body), where the focus is on finding the root cause of health issues rather than treating symptoms individually. As a patient you work with a team of health care professionals and treatment incorporates supplementation, nutrition, yoga, meditation, chiropractic care, and other self-care practices into treatment. It is a really cool and preventative approach, and the future of primary care, I think! I actually first discovered this type of medicine as a result of dealing with my health issues that were triggered by over-training, and it totally turned things around for me. What effect did competing and training as a runner have on your life? Running and training had such a positive impact on my high school experience, and also on my life. Hanover XC was the start of all of that and really helped shaped who I am today. Having running as an outlet in my life has been very meaningful because it’s there during tough times, joy filled times, and all those non-eventful times in between. Running is so familiar at this point that coming back to it always helps me to feel like myself, clear my head, and gain perspective. Training and racing over the years also really helped to occupy a part of my brain that likes to be focused on working toward a goal. Training and competition also taught me a lot about learning to trust and enjoy the process, to make sense of successes and failures, and to always step back and look at the bigger picture. At the end of the day, it should be fun and enjoyable! Do you have any advice to share with present high school xc runners? I would say, just try to enjoy the sport as much as you can! See if you can use it to help you practice setting goals, to learn to get comfortable being really uncomfortable, to learn to push yourself and then to trust yourself. I would also say try to take the opportunity to learn about your own unique mind and body and its strengths and weaknesses. And of course, the friendships and team aspect is such a huge part of the joy of the sport, so just try to be a good teammate, have empathy, support each other, be happy for other people’s success, because there is always room for everyone to succeed! XC Season is HERE!!! 1st Results of 2017!!! Coaches Send in Results and Pics!! Northeast Regionals: What to Watch For? Good to see Grace back in NH and back working with the runners from where she grew up. I remember her dominating 600 and 800 races throughout high school. Best of luck! Grace was always a class act. So fortunate to have such great coaches as Jim Eakin and Jeff Johnson. Wishing her the best in future endeavors. Next post Middle School Mania! Post Season Opportunities!